Explore Hurricane Ridge, The Hoh Rainforest, Pacific beaches and other delights of the Olympic National Park and Area: hiking, fishing, boating, birding, skiing, cycling. Come enjoy Sol Duc Hot Springs, Tongue Point Tide Pools , the Olympic Game Farm, and Wineries. Enjoy a short drive on Ediz Hook in front of Port Angeles where you may encounter shorebirds, otters, sea lions and perhaps a whale and panoramic views of the area. We also boast two, year round golf courses and two Casinos. Visit Cape Flattery the northwest corner of the US. Below are a few examples and links to area attractions, and ideas for day trips or if you plan to stay a week the possibilities are endless! See spectacular views with wildlife and birding possibilities while visiting Cape Flattery. And be sure to see the Makah Museum. A Hidden Haven has the best location to access all the Olympic Peninsula has to offer. Only minutes to the Victoria Ferry. Explore some of the possibilities below. Salt water kayaking is great! In less than 10 minutes from A Hidden Haven you can be at Adventures Through Kayaking, or Olympic Raft and Kayak, also you might want to check out Sound Bikes & Kayaks. Go tide pooling fifteen minutes from A Hidden Haven. Or only fifty-five minutes To Rialto Beach! Take the The Coho Ferry from Port Angeles to Victoria BC. Birding is awesome on the Olympic Peninsula! You can see many birds including Harlequin Ducks on Ediz Hook. 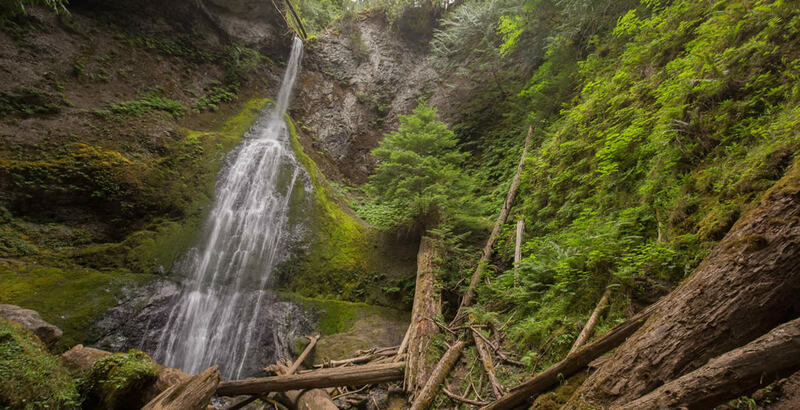 Take a Magical Misty Tour and explore the many Waterfalls on the Olympic Peninsula!